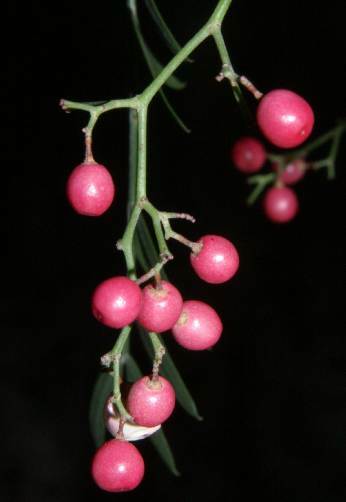 The pepper­corn-sized fruits are usually sold in dry state; they have a bright pink colour. Pink pepper ber­ries pickled in brine are less often traded. They have a more dull, almost greenish hue. Sweet and aromatic, similar to juniper (which makes a good substitute, though it is far more intensive). 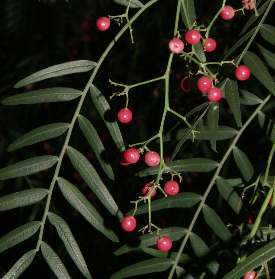 The berries are sometimes accused of causing respiratory ailment or irritation of mucous membranes, especially in Florida, where the species has proved quite invasive. 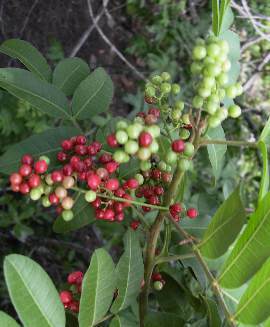 This may be due to urushiol-type allergens (see sumac), but the spice grown in Réunion appears to be free of urushiols, and the less effective cardanoles (3-alkylphenoles) were found in lower concentration than in Florida-grown pink pepper. Brazil (Schinus terebinthi­folius) and Perú (Schinus molle L.). 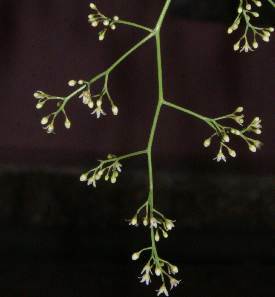 The former was intro­duced to Florida and today grows there wild; S. molle is commonly planted as an ornamental in the countries around the Medi­terranean Sea. The main producer for the European market is Réunion (Sch. teribinthi­folius), followed by Turkey and other Medi­terranean countries, where the spice is obtained from Sch. molle trees. 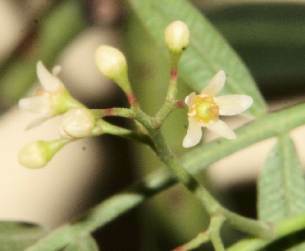 The botanical name Schinus terebinthifolius alludes to two Mediterranean trees that were esteemed since antiquity for their aromatic resins: mastic, Pistacia lentiscus (Greek schinos [σχῖνος]) and terebinth or turpentine tree, Pistacia terebinthus (Greek terebinthos [τερέβινθος]). Both belong to the same plant family as Schinus. 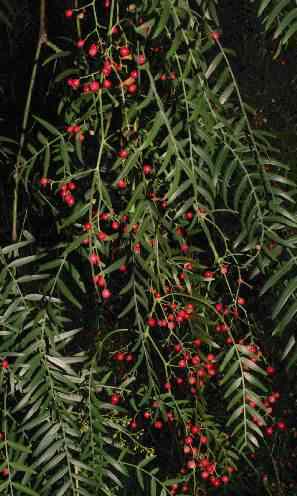 In Schinus molle, the species epithet reflects the Quechua name of the plant, molli. 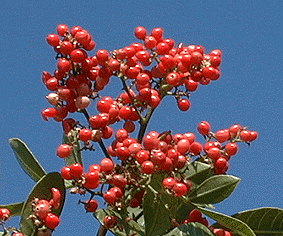 The Japanese name kurisumasu beri [クリスマスベリー] clearly is a rendering of English Christmas berry. I have no idea why they are called thus. Brazil pepper (Sch. terebinthi­folius) has small fruits of peppercorn size and is sometimes used in the European nouvelle cuisine, mostly in form of a decorative mixture with white, black and green pepper corns; the larger fruits of Sch. molle have appeared on the European market around 1950, but are no longer available. Pink pepper­corns are named so for their shape only, not for their flavour, which is not pungent, but mild and sweet. 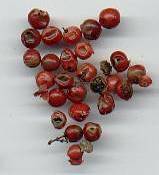 Pink peppercorns must therefore not be confused with the ripe pepper fruits that have reddish to brown hue, but show an intense peppery pungency and are generally much rarer. Both spices are available either dried or pickled in brine; yet dried red peppercorns are a very rare and expensive spice, while the dried form is common for pink pepper (pickled pink pepper is sporadically seen, though). The flavour of the small, pink berries also marketed as pink berries or pepper rosé is rather weak, and so these berries serve predominantly ornamental purpose, although they can develop a subtle flavour in food that has little other spices. Some books suggest them for fish and certain vegetables (e. g., asparagus); this recommendation makes much more sense for me than the often found habit to mix black, white and green peppercorns with pink pepper; in such a mixture, the subtle flavour of pink pepper gets mostly lost. It is far better to mix in a few allspice berries if one wants to have a pepper with an exotic and aromatic flavour, or use a spice mixture like quatre épices instead (see nutmeg). 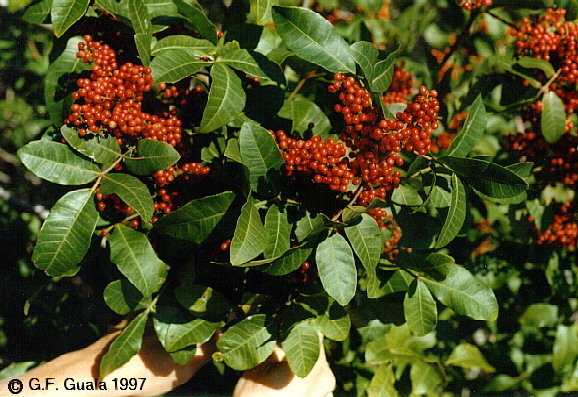 In the 1970s there was some concern about potential health hazard in connection with pink peppercorns, as phenolic irritants were found in a couple of Schinus and other Anacardiaceae species. In dried pink peppercorns, however, only very weak (if any) irritating action was confirmed. Yet even now some books recommend that pink pepper should only be used with caution, especially for people suffering from chronic inflammation of the gastric mucosa.